Recent research revealed that online users spend one in every five minutes on the internet on social media. That’s an opportunity for lead generation that no marketer can ignore. New social media platforms pop up all the time, but how is a busy marketing manager to know which one to utilise and which not? The key is firstly to identify which platforms your clients (and potential clients) frequent and secondly, to understand why they have chosen that particular platform. The answers to those fundamental questions will give you, as a marketer, crucial insight into the people who make up your client base. With time always being any marketer’s toughest challenge, focus on playing smart and be selective. Start conversations with your buyer personas in the right places. Your potential leads are most likely active on any of the 5 big ones which we outline below. If you operate in a very specific industry or niche, you might find another platform geared towards that industry, in which case, you will have to build your business presence there. Twitter. It’s big. Very big. If it’s going to go viral it’s going to happen on Twitter. Why? Twitter has 240 million active users, with an average of 500 million tweets per day. This means that Twitter’s reach is so far and so wide that there isn’t a demographic or nook of the market that it doesn’t touch. But not only is the net wide, it’s also has hooks in the form of the hashtag - #. Catchy content with the right hashtags can trend and gain even more popularity. Making use of already trending hashtags is another good way to pull more followers and expand your audience. Use Twitter to put your business in the best possible light and post content that is relevant and you will soon attract followers. Twitter is all about the relationship with your audience. Meet new and interesting people on Twitter and then connect on other networks too once a connection is established. Make it about more about them and less about yourself. Share information interesting to them, connect with influencers and build a rleationship and build your "fanbase" - people who help you share and spread your message. With 1.2 billion users Facebook is by far the biggest of all social networks. What once started as a network on campus is now an advertising media tool of note and has changed how any marketer can reach a highly targeted audience. Facebook ads are an inexpensive and highly effective way to create awareness around your brand. Its demographic targeting options are astounding and help you reach your specific audience. Gone are the days of mass marketing to an unknown audience in the hope of reaching a few. Today you can reach these few right away thus leading to much higher conversion rates and a better ROI. The important factor to understand for any marketer is that unlike a platform like LinkedIn which is exclusively for business use, Facebook is a place where people go to have fun and stay in touch with their friends and families. Annoying advertising is a turn off. Understanding this and using the platform accordingly will lead to an ever-increasing audience on Facebook. As with all platforms the key to using it is to drive the people who come across your brand back to your own platform, your website. Facebook is the ideal tool to convert occasional browsers into leads with specific and targeted educational offers (such as ebooks, for example). Google+ is growing at a rapid rate. Currently it has approximately 540 million active users, which is a 54% growth since 2012. Why are more people using Google+, you may ask? Interconnectivity is the answer. Google+ offers interconnectivity to its other products (Search, Maps, Gmail, Drive, Blogger, and YouTube). The draw factor of having everything at your fingertips in one place is a strong one. The ability to categorise followers is also a big feature. Sharing content selectively offers a sense of control. No doubt that it’s blurring the boundaries between personal and business profiles, but it also pushes SEO and gives companies a piece of the Google search engine pie. It's a big pie and simply cannot be ignored. LinkedIn is the top business platform. Naturally geared towards industry, professionals and related spheres of business, it comprises the densest demographic of people that can make a significant difference to your business. On LinkedIn your business will rub shoulders with recruiters, vendors and media contacts. Posting regular content that is engaging and thought provoking on your LinkedIn Company page will strike up conversations with all the right people and bring your business into the spotlight. The incidental visible credibility won’t hurt either. Find active and interesting groups on LinkedIn and join the conversation, be an active participant and provide help all along the way. This helps to establish yourself as the known go-to source for your industry specific information. Helping your employees increase your business' presence on LinkedIn is an important strategy to consider and all too often neglected. If your buying persona has been identified as female first – then Pinterest is a must. Visually appealing products related to fashion, food, babies, weddings, design and travel attract the most attention on this platform. Of the 70 million active users, 80% are women. Recent trends indicate that more men are turning to Pinterest too nowadays. Men are searching for sport related pins, cooking and DIY projects. For the creative marketer with a pretty or innovative product and a female audience, Pinterest is a lead generating platform that will get people talking. 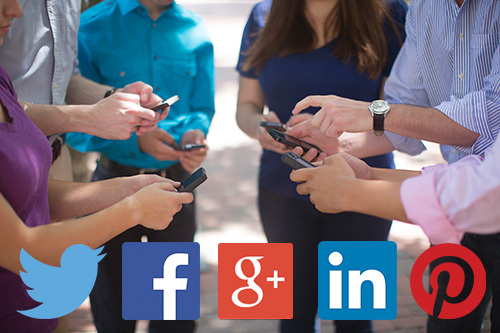 Have you yet identified the social media platforms you should most frequent? Let us know in the comments.